The government has partially shut down. The GOP is not part of that shut-down, as far as I know. So they’re still “open,” right? If I were in charge of the GOP, which I really should be because then Republicans would be a shoo-in to win, I’d spend millions on TV and radio ads right now, explaining what just happened. I mean from the perspective of the non-Obama cult, as opposed to the non-Fox News Channel media’s version. There are any number of superb audio and video clips featuring Ted Cruz, Marco Rubio, even Sen. Mitch McConnell from this morning. I’d also second some Twitter personalities, who, in my experience, have advanced the conservative side of the story far better than most politicians. In my massive ad campaign, I would also feature news media reporters and anchors who have purposely misled and deceived their audience, in order to advance the Obamacult movement. That would be my favorite part. There are myriad examples. Turn on the TV, and hit record. You’re done. Even as I type, the Obamacult is in action. 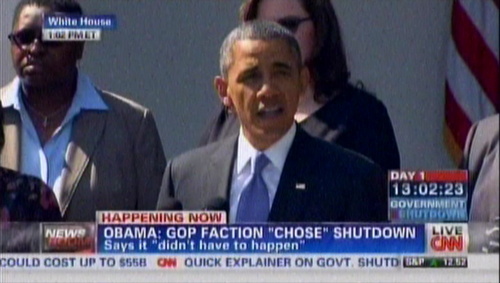 Obama is using his bully pulpit yet again, politicizing again (and yet he is expecting a different outcome, this time. Huh); and CNN is helping with that great chyron, and what’s interesting is that the message contained therein is repeated over, and over — not by Obama, but by them in the media. Obama keeps reiterating, like a salesman instead of a president, the line, “The Republicans shut down the government.” Somebody, somewhere, should really say something truthful. Hey I know, the Republican Party should! Here’s another free idea (and this one costs you nothing, in case you don’t have any conservatives contributing to your party, as I would expect would be the case): I’d at least pretend to keep up with the swells on Twitter and Facebook, as even I do (my being decidedly not one of the swells, aside). #HarryReidsShutdown was a hashtag started not by the Republican Party, or Mitch McConnell, or Speaker Boehner, or any other Republican stalwart. It was started by @RBPundit — just a guy on Twitter who cares. It became popular to use when, after a little goading, Ted Cruz started using it. How come? How come the GOP didn’t think of this and get it trending? You do understand you have to win the hearts and minds of the public, and the Obamacult is doing that, right? You know what would get #HarryReidsShutdown trending? If @TedCruz tweeted it. The liberals and their media are unrelenting. They do not give up. They may get frustrated, but they won’t quit. So the GOP might want to start fighting back and revealing the truth to Americans. You know, so you might actually win an election.